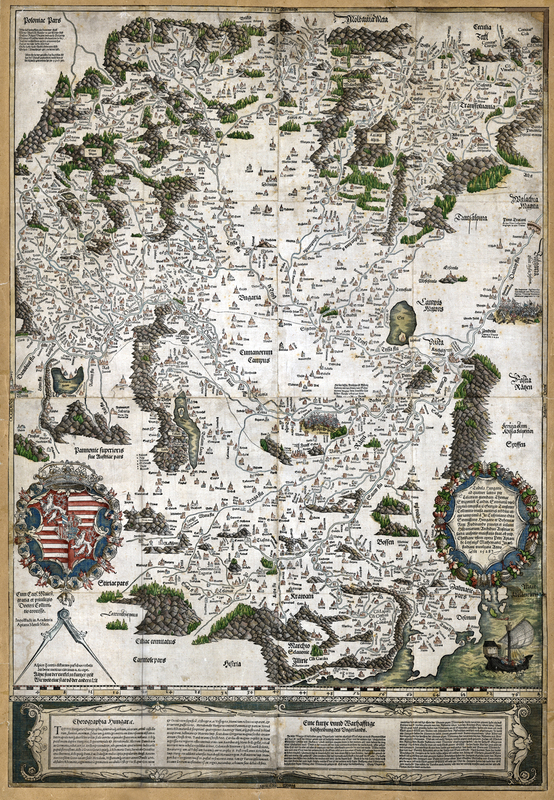 The first printed map of Hungary, the Tabula Hungariae was published in 1528. The map, which has a size of 785 x 540 mm, shows the area of the medieval Hungary, and with a dotted line, the southern areas conquered by the Ottoman Empire. A remarkable fact is that the map, apart from the borders, only displays the southern areas, and the border defence system is highly emphasized. This thorough, detailed map is also an important source of historical geography, since many of the shown settlements have disappeared during the wars or the occupation. The most likely goal of the map was to help prepare against the ottomans and to introduce the defence systems of the southern border. Even though this map is recognized internationally, and despite the research done in the past decades, there are still open questions about it. About its importance, goal, way to publication and copies published later in the 16th century, valuable findings were obtained. Our site is based on the results of Katalin Plihál, map historian, and aims to introduce the map as a piece of culture, and as a historical, linguistic, and cartographic source. In 2007, the Tabula Hungariae was placed on UNESCO’s Memory of the World Register, which is a compendium of documents, manuscripts, oral traditions, audio-visual, materials, library, and archival holdings of universal value, and promotes this invaluable heritage.